Pineal gland is also known as epiphysis cerebri. It is a small, reddish gray midline sessile organ placed posterosuperior to the main thalamic mass. In some classes of fishes and amphibian, this structure used to represent dorsal third eye. In higher animals and in the past in case of human, this organ was considered as vestigial organ. That is why it is used to be termed more commonly as pineal body. Nowadays this is more popularly termed as pineal gland as it is very highly evolved endocrine gland exerting influence in activities of so many endocrine glands of body including hypophysis cerebri (pituitary gland). Special characteristics .Following are very special characteristics of pineal gland. Pineal gland, an endocrine gland, though present in the brain, does not contain nerve cells, but contains neuroglia (astrocytes) and modified neurons. The gland receives some nerve fibers called nervus conarii, which are postganglionic sympathetic fibers coming from superior cervical ganglion. After two decades of life, pineal gland may show some age changes characterized by deposition of calcium salts. Calcification will show tiny opaque shadow in radiological imaging. This is called ‘Brainsand’. Pineal gland is a small, reddish gray, sessile, conical organ, lying posterosuperior to main thalamic mass and it is lodged in a small depression between two superior colliculi. Above it is related to splenium of corpus callosum. Anteroposteriorly it measure 8 mm with the base directed forwards. Base of the gland is pedunculated. Peduncle of pineal gland (pineal stalk) is split up to form proximal (superior) and distal (inferior) laminae. In between two laminae, a smallconical outpouching of third ventricle of brain forms its pineal recess. Both the laminae of pineal stalk present transversely running fibers forming commissures. Fibers passing through upper lamina form Habenular commissure and fibers through lower lamina form posterior commissure. Some fibers invading the gland are called aberrant commissure which of course, do not terminate in cells of pineal gland. Reader is suggested to consult the chapter of white matter of Brain for further details about the commissures. Superiorly pineal gland is related to splenium of corpus callosum. Tela choroidea of third ventricle of brain invaginates between splenium and the gland. Inferiorly pineal gland is related to tectum of midbrain. Pineal gland is covered by an envelope of pia mater derived from inferior layer of tela choroidea which is ultimately continuous over tectum. Anteriorly, base of pineal gland presents the peduncle (pineal stalk). In between two laminae of the stalk is the pineal recess of third ventricle of brain. 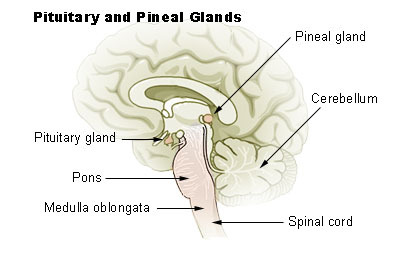 Pineal gland is classically known as neuroendocrine gland. Pia mater from inferior layer of tela choroidea of third ventricle forms an envelope of the gland. From this pial capsule, number of septae enter inside the gland to divide it into number of lobules. The septae also carry blood vessels and thin unmyelinated sympathetic nerve fibers arising from superior cervical ganglion. The gland is richly supplied by arteries which are branches of medial division of posterior choroidal branch of posterior cerebral arteries. Capillaries end in numerous pineal veins which finally come out to drain into internal cerebral vein and/or great cerebral vein of Galen. Number of indoleamine and polypeptide hormones, including melatonin are secreted by pinealocytes. These hormones exert widespread regulatory effect on many endocrine glands of body, e.g.